Expert analysis of the leisure industry is an important part of our ethos. We are a founding partner of the Coffer Peach Business Tracker, the established industry sales monitor for the UK pub, bar and restaurant sectors. 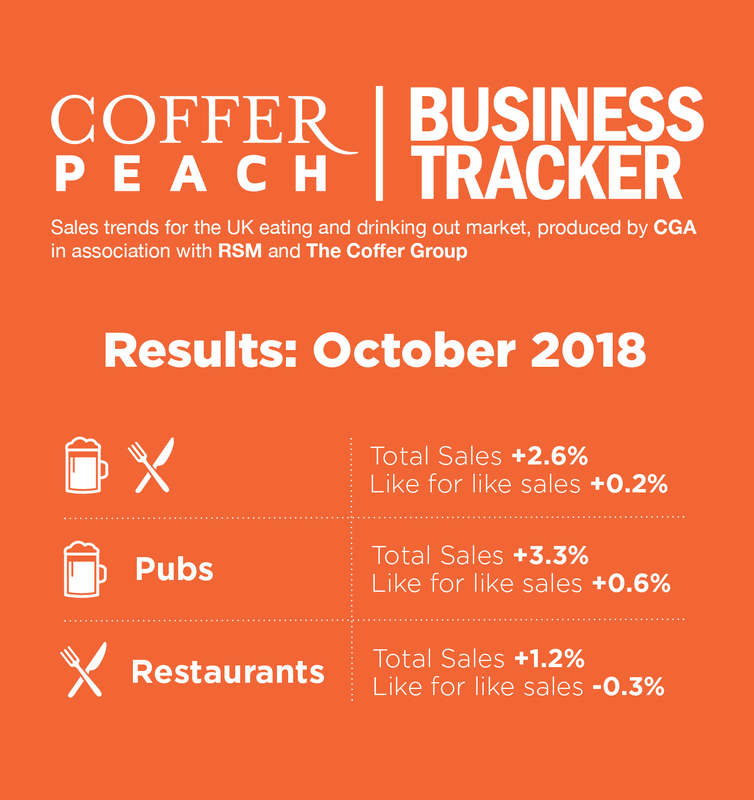 Britain’s managed pub and restaurant groups saw collective like-for-like sales grow just 0.2% in October, according to latest figures from the Coffer Peach Business Tracker – with pubs and bars doing better than casual dining chains. “People are still going out to eat and drink, but there is little or no growth in the market – and stronger London trading is making up for poorer sales outside the M25,” said Phil Tate, chief executive of CGA, the business insight consultancy that produces the Tracker, in partnership with Coffer Group and RSM. Regionally, London saw like-for-likes grow a relatively healthy 2.5%, against a 0.5% like-for-like sales fall outside the capital. Pub and bar groups were the top performers both nationally and in London. Across the country, managed pubs and bars were collectively ahead 0.6% on a like-for-like basis, and up 3.6% in London against last October. However, sales declined by 0.4% outside the capital. Restaurant chains also did relatively better in London, with like-for-likes up 0.9% compared to a 0.7% fall in the rest of the country. However, the national figure showed a 0.3% decline, reflecting the continuing pressure on the casual dining sector. You can't use multiple time the same shortcode. CGA Peach collects sales figures directly 49 leading companies. Participants include Mitchells & Butlers (owner of Harvester, Toby, Miller & Carter, All Bar One etc), Pizza Hut, Whitbread (Beefeater, Brewers Fayre, Table Table), Pizza Express, The Restaurant Group (Frankie & Bennys, Chiquito, Brunning & Price), Spirit Group (Chef & Brewer, Flaming Grill, Fayre & Square), Casual Dining Group (Café Rouge, Bella Italia, Las Iguanas), Stonegate (Slug & Lettuce, Yates’, Walkabout), Deltic, TGI Fridays, Marston’s, Azzurri Restaurants (Zizzi, ASK), Wagamama, YO! Sushi, Prezzo, Novus (Tiger Tiger), Fuller’s, Carluccio’s, Young’s, Living Ventures, The Alchemist, Gusto, Strada, Amber Taverns, Hall & Woodhouse, Gaucho, Giraffe, Loungers, Byron, New World Trading Co, Peach Pub Co, Le Bistrot Pierre, Laine Pub Co, All Star Lanes, Le Pain Quotidien, Fazenda, Liberation Group, Wadworth, Honest Burgers, The Snug Bar, Downing LLP (investment partner of Antic London), Bermondsey Pub Company, Revolution Bars Group, Polpo, Bill’s, McMullen & Sons, Coaching Inns Group, Rileys Sports Bars and Mowgli. At Imbiba we take the view that you need to do things differently in order to confront the levelling effect of competition…you need to interpret the data in a different way to other people. DCL has helped us enormously over many years in achieving this. In addition their connections are unrivalled in this industry.